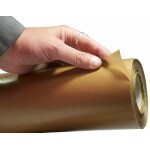 Waxed Kraft Paper is a commercial quality paper, laminated with wax on each side to create a moisture resistant barrier. Waxed Kraft paper provides a water-repellent protection for your items. It can can be used for wrapping greasy or oily components, ideal for the engineering industry and automotive applications as a corrosion inhibitor, for lining export boxes or other large corrugated or wooden cases. Sold in handy 900mm x 100m rolls, enabling you to cut your own wax paper sheets to the exact size you require.